Whey Protein Concentrate, Milk Protein Concentrate, Whey Protein Isolate, Xanthan Gum, Microcrystalline Cellulose & Dicalcium Phosphate. Manufactured on equipment which processes products containing milk, egg, soybeans, shellfish, wheat and tree nuts. 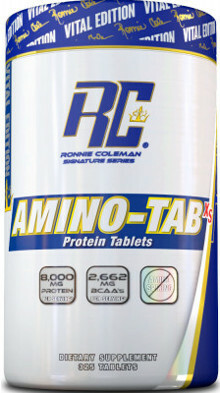 Amino Tab is a true protein in a tablet from whey protein concentrate, milk protein concentrate and why protein isolate yielding 8g of protein and 2.6g of BCAA per serving. Perfect for anyone looking for a quick and easy way to increase their protein and amino acid intake.